Mathematics, Mechanical, Mining, information Technology, Humanities & Social Sciences, Electronics & Tele Communications, Electrical and Metallurgical Engineering discipline. Total available vacancies in NIT, Raipur Assistant Professor Recruitment are 55 posts. All eligible candidates have to go through the NIT official website www.nitrr.ac.in. Closing date for Application registration through online is 15-December-2017. Printout copy of application form must send to the address given in the notification before 22-12-2017. Applicants should have maximum age limit is 60 years. Application fee for UR, OBC applicants is Rs. 500/- and for PwD/ SC/ ST applicants is Rs. 250/-. 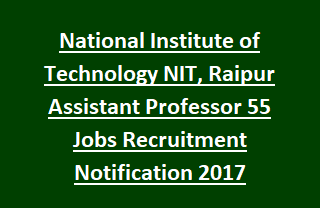 More information regarding National Institute of Technology NIT, Raipur Assistant Professor Jobs Recruitment Vacancies, Eligibility Criteria, Age details, Selection Process, Application Procedure, Examination Fee details are mentioned below. Total vacancies available in National Institute of Technology, Raipur Recruitment are 55 posts. Total no of vacancies: 55 posts. BE/ BTech & ME/ M.Tech or M.Arch or M.Plan or equivalent qualification with PhD degree in relevant discipline. Candidates will be offered salary as per NIT, Raipur Govt rules. Maximum age limit for Assistant Professor Jobs is 60 years. Candidates will be selected for Assistant Professor Jobs is based on marks percentage in educational qualifications and experience. There is no application fee for Teachers/ Employees of NIT, Raipur. Candidates who are interested for Assistant Professors vacancies in NIT Raipur recruitment are advised to go through the National Institute of Technology official website www.nitrr.ac.in. Open the application form in respective discipline. Fill the required fields and submit the application before 5-December-2017. Last date for the hard copy of application form is 22-December-2017.